Conservationists worry non-native mountain goats damage fragile alpine plant ecosystems; some hotly dispute that state authority on wildlife transplants trumps federal law. (Photo courtesy of Marc Coles-Ritchie, Grand Canyon Trust) Conservationists say introduced mountain goats in Utah's La Sal Mountains, pictured here in July 2017, are damaging Mount Peale's fragile alpine ecosystems. Utah wildlife officials are now developing proposals to establish goat herds in other Utah ranges where this big game species is not native. 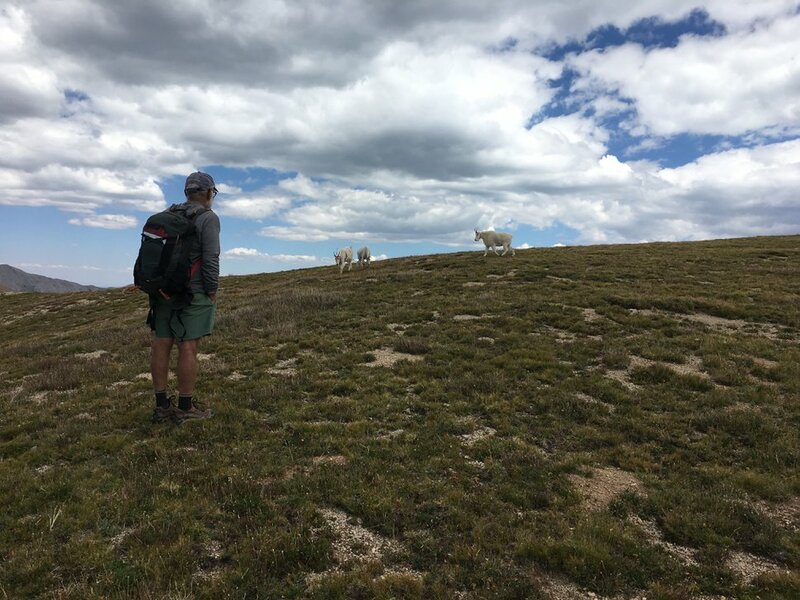 (Photo courtesy of Marc Coles-Ritchie, Grand Canyon Trust) Conservationists say introduced mountain goats in Utah's La Sal Mountains, pictured here in July 2017, are damaging Mount Peale's fragile alpine ecosystems. Utah wildlife officials are now developing proposals to establish goat herds in other Utah ranges where this big game species is not native. (Photo courtesy of Marc Coles-Ritchie, Grand Canyon Trust) Conservationists say introduced mountain goats in Utah's La Sal Mountains, pictured here in July 2017, are damaging Mount Peale's fragile alpine ecosystems. Utah wildlife officials are now developing proposals to establish goat herds in other Utah ranges where this big game species is not native. (Photo courtesy of Marc Coles-Ritchie, Grand Canyon Trust) Conservationists say introduced mountain goats in Utah's La Sal Mountains, pictured here in July 2017, are damaging Mount Peale's fragile alpine ecosystems. Utah wildlife officials are now developing proposals to establish goat herds in other Utah ranges where this big game species is not native. 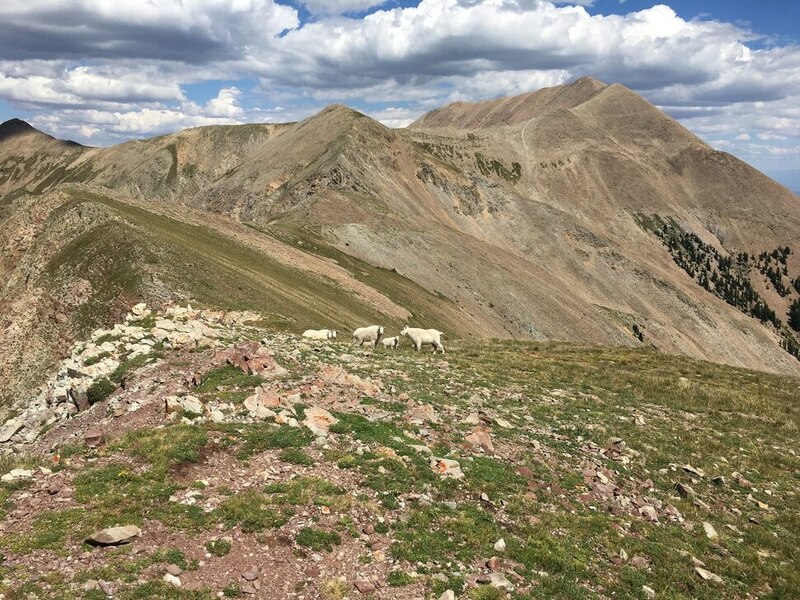 (Photo courtesy of Marc Coles-Ritchie, Grand Canyon Trust) Conservationists say introduced mountain goats in Utah's La Sal Mountains, pictured here in August 2017, are damaging Mount Peale's fragile alpine ecosystems. Field volunteer Dennis Sivla observes a group as they follow him into a research plots under study by teams monitoring the area for changes due to the presence of goats. Utah wildlife officials are now developing proposals to establish goat herds in other Utah ranges where this big game species is not native. 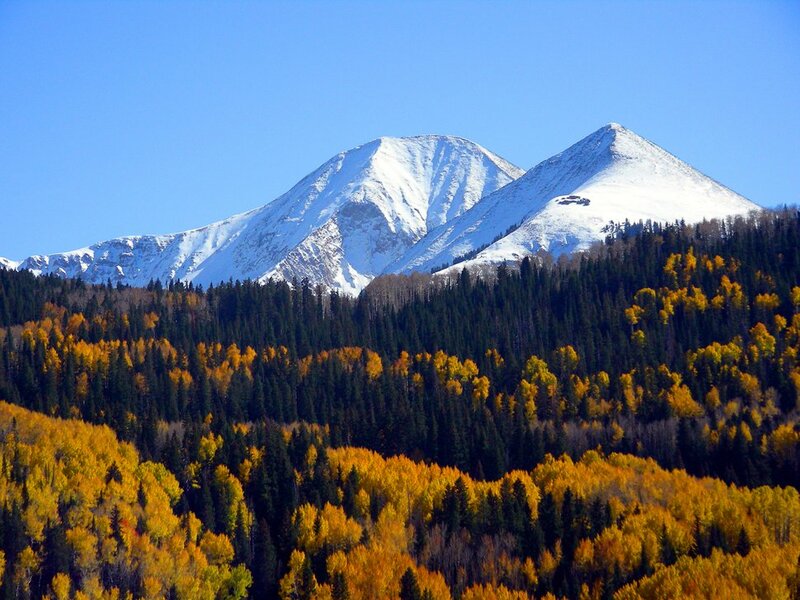 (Photo courtesy of U.S. Forest Service) The La Sal Mountains rise above fall colors in the Manti-La Sal National Forest. (Scott Sommerdorf | Tribune file photo) The U.S. Forest Service initially opposed a state plan to introduce non-native mountain goats into the La Sal Mountains, but did not block it. Utah wildlife officials are now developing proposals to establish goat herds in other Utah ranges where this big game species is not native. An experiment is underway in the La Sal Mountains, where a species of wild mountain goat is making a new home along the eastern Utah range’s rock-studded ridge lines and talus slopes falling away from 12,000-foot peaks. Four years after their introduction by state wildlife officials, the creatures classified as ungulates appear to be thriving, with their numbers more than doubling. Their soft curved hooves work like suction cups on sharply angled rock, enabling the animals to negotiate near-vertical terrain. Famous for their long white hair and climbing prowess, mountain goats’ young are born able to walk. The charismatic game animals appear to be well suited for Utah’s peaks, but are these lofty alpine places and their delicate plant ecosystems suitable for goats? Many ecologists doubt it, yet Utah wildlife officials expect to double down with a dramatic expansion of a 50-year-old program for establishing new populations in ranges that haven’t seen goats since the ice age. “These environments are exceedingly fragile. Plants take a long time to grow in these places. It’s a really harsh environment,” said Tony Frates of the Utah Native Plant Society, which has gone to court to get the U.S. Forest Service to remove goats from the La Sals. Officials with the state Division of Wildlife Resources are now readying a proposal to transplant goats into the Deep Creek Mountains in Juab County near the Nevada border and investigate whether to put them in several other ranges, including the Stansbury Mountains, according to a presentation given to the Wildlife Board at its Sept. 28 meeting. Wildlife officials are gathering data on alpine plant communities and will hold public meetings as they develop a Deep Creeks goat plan over the next year, big game specialist Rusty Robinson told the board. Because they involve public lands, Utah’s goat transplant projects can run afoul of federal policies that frown on putting non-native species into landscapes administered by the Forest Service, Bureau of Land Management and the National Park Service. (Photo courtesy of U.S. Forest Service) The La Sal Mountains rise above fall colors in the Manti-La Sal National Forest. But federal agencies have traditionally deferred to state officials when it comes to managing wildlife outside parks. Goat introductions take place without the typical study and review required under the National Environmental Policy Act because they are considered a state action not subject to the federal law. But the notion that states holds “supremacy” over wildlife is based on a legal myth that needs to be busted, argues University of Montana professor of natural resources policy Martin Nie. In a soon-to-be-released study, Nie and colleagues argue federal agencies have illegally given in to states on wildlife matters — with a focus on the La Sals goat case, which is now before the 10th Circuit Court of Appeals, as well as several states’ predator-control programs that target protected species. 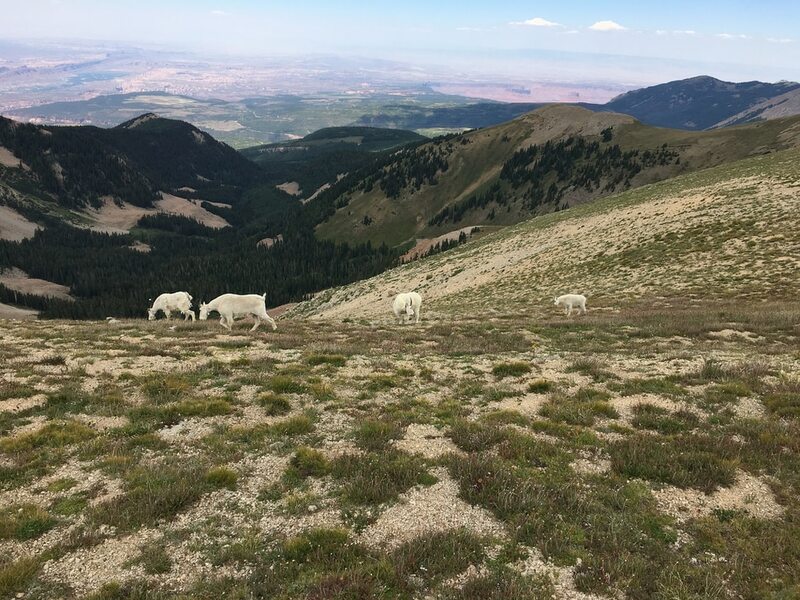 (Photo courtesy of Marc Coles-Ritchie, Grand Canyon Trust) Conservationists say introduced mountain goats in Utah's La Sal Mountains, pictured here in July 2017, are damaging Mount Peale's fragile alpine ecosystems. Utah wildlife officials are now developing proposals to establish goat herds in other Utah ranges where this big game species is not native. Nie believes the BLM and Forest Service should exercise far more control over Utah’s goat introductions, but the state had gotten around that by releasing goats on non-federal land adjacent to the publicly owned mountaintops where the animals are expected to take up residence. For the Deep Creeks, which is largely overseen by the BLM, Utah would release goats on Goshute tribal land. While mountain goats are native to the Northern Rockies, most biologists agree they never inhabited Utah and other western states before modern introductions began a century ago. But Utah peaks have proven to be hospitable terrain and people have long enjoyed watching them on Lone Peak and Mount Timpanogos. The success of Central Wasatch introductions have spurred DWR to put goats in the Tushars, Mount Dutton, the Uintah and most recently the La Sals. About 2,000 goats now roam Utah, and less than 200 hunting permits are issued each year. Holders of these once-in-a-lifetime permits enjoy a 97 percent success rate. But it’s not just hunters who enjoy these animals. Wildlife viewers love the chance to catch a glimpse goats clinging to Wasatch ridge lines, according to DWR. 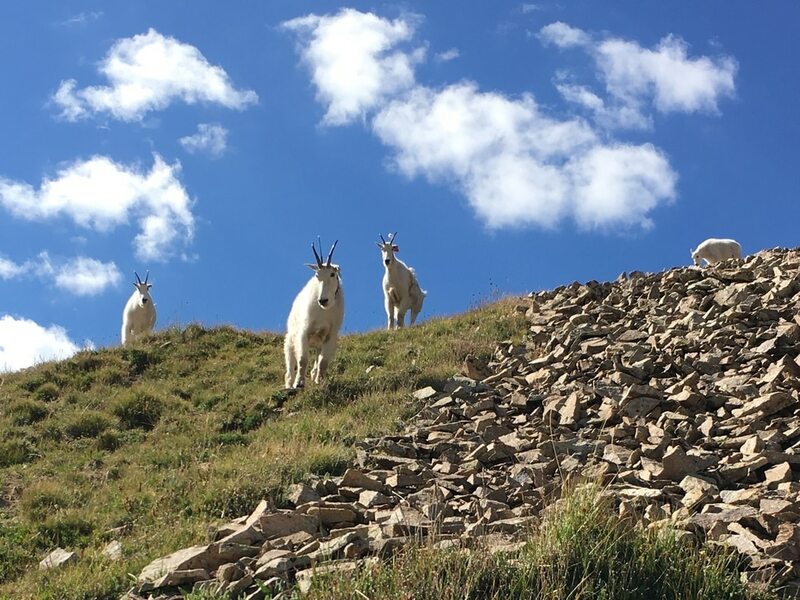 (Photo courtesy of Marc Coles-Ritchie, Grand Canyon Trust) Conservationists say introduced mountain goats in Utah's La Sal Mountains, pictured here in August 2017, are damaging Mount Peale's fragile alpine ecosystems. Field volunteer Dennis Sivla observes a group as they follow him into a research plots under study by teams monitoring the area for changes arising from the presence of goats. Utah wildlife officials are now developing proposals to establish goat herds in other Utah ranges where this big game species is not native. Goats prefer steep, rocky terrain higher than 9,000 feet where there isn’t much tree cover, said Robinson. In winter, their range descends to 6,200 feet on west-facing slopes. A statewide goat plan adopted in 2013 identifies the Deep Creeks for a future introduction. Last year, DWR convened a group to make recommendations for “ungulate restoration” in these mountains capped by the 12,101-foot Ibapah Peak. The study group, which met four times, initially included wool growers, members of the Goshute tribe, the Bureau of Land Management, sportsmen and biologist Allison Jones of Wild Utah Project, which does wild habitat research and digital mapping. Jones resigned after the first group’s meeting because its clear slant toward goat introduction, despite evidence that the goats were causing damage in the La Sals. 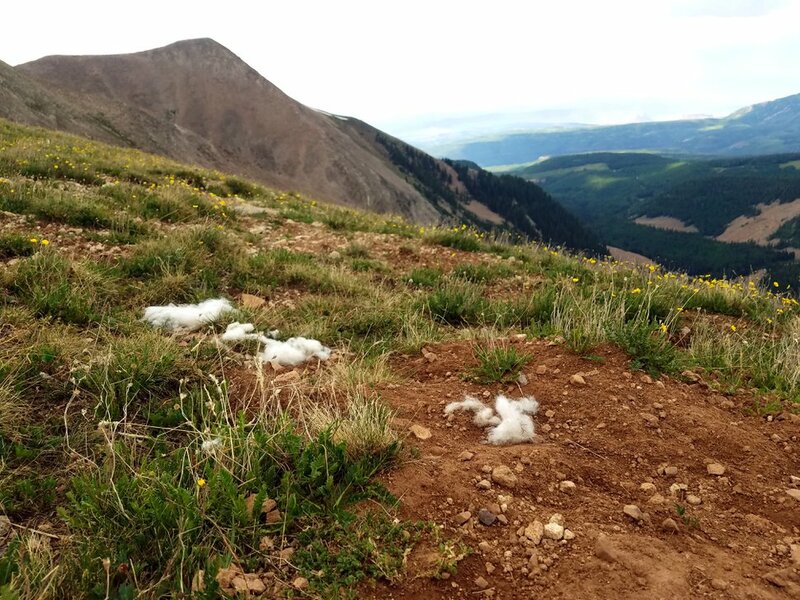 (Photo courtesy of Marc Coles-Ritchie, Grand Canyon Trust) Conservationists say introduced mountain goats in Utah's La Sal Mountains, pictured here in July 2017, are damaging Mount Peale's fragile alpine ecosystems. This photo shows goat hair left on a high ridgeline where goats have wallowed, exposing soils. Utah wildlife officials are now developing proposals to establish goat herds in other Utah ranges where this big game species is not native. “Putting mountain goats in the Deep Creeks could result in the degradation of significant alpine resources, not only to sensitive high elevation alpine soils on steep slopes that are already prone to erosion, but also to rare and sensitive indigenous plant species found on those soils,” she wrote in her letter of resignation. Jones was unhappy DWR considered goats native based on the presence of a related species extinct since the Pleistocene, when the West was much colder and more damp. Fossil remains of the extinct Harrington’s goat have been recovered near the Deep Creeks in Smith Creek Cave. “The plants that exist in the Deep Creeks today are not the same plants that existed 15,000 years ago. Any adaptations those plants may have had to withstand grazing have been lost,” Jones said. Bighorn sheep is DWR’s preferred species for these mountains, but two attempts to re-introduce the native ungulate failed to bear much fruit. 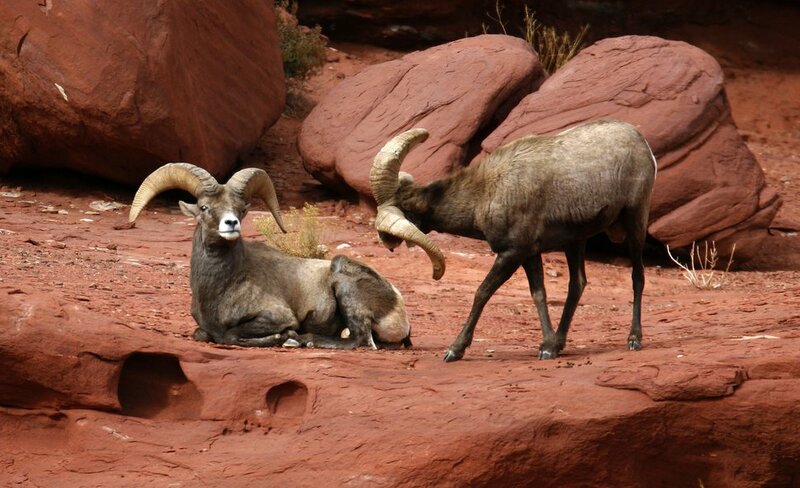 A total of 30 desert bighorn sheep were released in 1984 and 1989. Robinson suspects exposure to pathogens carried by domestic sheep grazing the lands surrounding the Deep Creeks prevented the translocated animals from establishing successful herds. The study group concluded that goats would be suitable substitute for bighorns. “Alpine environments evolved in the presence of herbivory. We know bighorn sheep used to graze there so goat fills that niche. We believe it is healthy for the ecosystem to have ungulates on there eating the alpine plants,” Robinson said. The Deep Creeks have 34,400 acres of terrain higher than 9,000 feet, on par with the La Sals, where the target goat population is 200. The draft plan estimates this habitat can support 250 goats, or one goat for every 4.65 square miles. Jones dismissed Robinson’s reasoning. Goats would get into terrain that is inaccessible for bighorn sheep and would trample places in spring and fall when moist soils are most vulnerable to disturbance, she said. For the La Sal introduction, DWR used 35 goats from the Tushars, where goats have exceeded population targets. But for future introductions, Utah will likely tap Wyoming and Washington’s “excess” goats, Robinson told the Wildlife Board. These state are exploring whether to get rid of introduced populations in Teton and Olympic national parks. (Steve Griffin | Tribune file photo). Bighorn sheep, seen near Moab in 2005. Nevada introduced goat populations in the Ruby and East Humboldt ranges but has no plans to add goats elsewhere. Utah’s goat plan, which expires next year, does not identify any new ranges for introductions beyond the Deep Creeks. But DRW has modeled several others, according to Robinson, and identified some for possible introductions: Stansbury Mountains, Logan Peak and Wasatch Plateau. The Pahvant, east of Fillmore, and northern Wasatch above Farmington, are already being colonized by goats that have wandered in from neighboring areas. As timbered lower elevations, these ranges are not ideal goat terrain, so DWR leans toward allowing goats to establish themselves there “naturally,” Robinson told the Wildlife Board. Before DWR seeks any new populations, Robinson said, the agency would build existing herds on Dutton Mountain and eastern Uintas.